Paul C. Rollins, Sr., was born in Greensboro, Alabama. His affiliations with the funeral industry began as a teenager by washing cars on weekends at Sawyer Funeral Home in Greensboro, Alabama. In time, dedication, loyalty, interest and willingness to learn resulted in being assigned greater job responsibilities. He eventually advanced to public relations, assistant manager, and general manager. His former employer, Eugene Sawyer, owner of Sawyer Funeral Home- was his mentor in the funeral business. Paul always envisioned himself as owner of a funeral home. As a young man, Paul also worked for Lee's Funeral Home, owned by Hampton D. Lee, in Marion, Alabama. In February 1966, Paul moved to Tuscaloosa to work for a local funeral home. Four days after arriving in Tuscaloosa, he met Shirley Ann Smith who was playing piano for the funeral he was directing at her home church. At the time, Shirley was employed as a public school teacher. Six months later, Paul and Shirley were married. Rollins' Mortuary, founded by Paul C. and the late Shirley Ann Smith Rollins, opened its doors July 2, 1968, at 1429- 27th Avenue, Tuscaloosa, Alabama, to provide professional funeral services to Tuscaloosa and the surrounding West Alabama Community. Two days after opening the doors, Rollins' Mortuary received the first call to provide professional service to a bereaved family. Rollins' Mortuary's first site was an old building where a funeral home had previously been housed. Their meager beginning assets included one car, one casket (that was donated by Paul's former employer), and very limited capital in the amount of $50.00. Paul and Shirley sometimes think they invented the phrase "day to day operation." Unwilling to let such restrictions hold them back, the Rollins' took whatever they earned and reinvested it back in the Mortuary. They believed the key was "investing back into their business." Rollins' (beginning/ original) staff consisted of their dedicated and loyal friends (often working without pay) who shared the Rollins' vision and interest in providing dedicated and professional service to the area. In 1970, Shirley resigned her position as a public school teacher to devote full-time and attention to their investment- Rollins' Mortuary. Paul and Shirley did a proposal with future projections for the success of Rollins' Mortuary. The projection was that through rendering personal, professional and sympathetic service, they could within ten years build an ultra modern building to accommodate the needs of the community. However, with much sacrifice and hard work, in July 1977, after only nine years in business, the Rollins' were able to build a new modern building for Rollins' Mortuary located at 2701- 32nd Avenue (now Martin Luther King, Jr., Blvd). The buildings interior design was remodeled in the winter of 1994. Major renovations were completed on the buildings exterior in the summer of 1999. After 45 years, The Rollins family and their dedicated Staff continue to provide unique professional services to all families served. 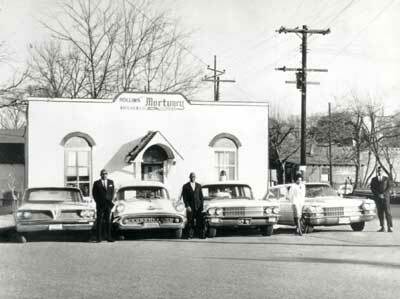 Rollins' Mortuary remains family owned and operated.